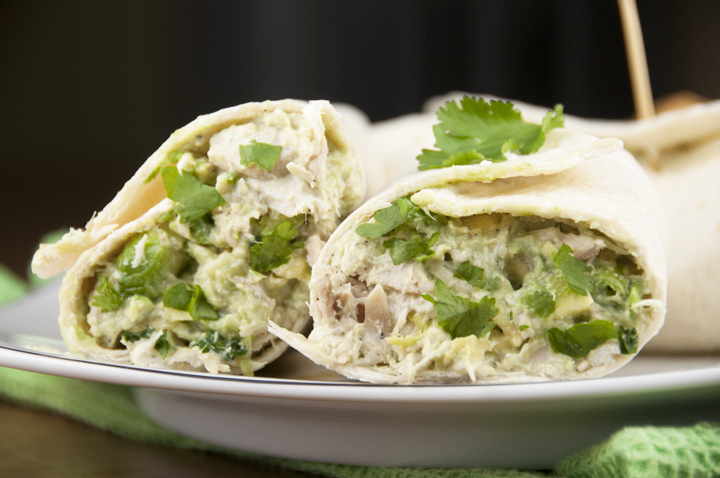 Healthy, high-protein avocado chicken salad recipe using Greek yogurt instead of mayonnaise! 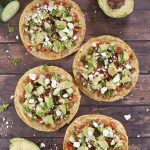 You can use sandwich bread, a bed of lettuce, pitas, crackers or wraps to go with this easy lunch or weeknight dinner idea. How was your weekend? Mine was full of food, including this Avocado Chicken Salad. 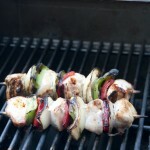 I just love a quick, healthy meal – especially in the summer! This past weekend was a lot of fun. I went to the carnival here in town and saw a couple of live concerts. I don’t know what it is about a carnival in the summer, but I love it. I not only love the wide array of games, rides, cotton candy, sno-cones, popcorn, but I mostly love the atmosphere. They remind me of my childhood and how my mom used to bring my brothers and I to the Webster Fireman’s Carnival back in the day. They are nostalgic for me! Mr. Wishes and I went to the Charlie Daniels Band concert on Wednesday and it was awesome. Charlie Daniels is almost 81 years old and rocking out as if he was 30 still. He still sounds the same as when he was young! Hearing “The Devil Went Down to Georgia” live was pretty cool, I’m not going to lie. I have to be honest, I didn’t expect to like this avocado chicken salad as much as I did, especially given the absence of mayonnaise. I didn’t know if it would have the creamy texture that chicken salad is supposed to have. It was honestly SO delicious made with the Greek Yogurt! If you are an avocado lover and also love chicken salad (both of which I am pretty much obsessed with) then this recipe is for you. It tastes so good that you won’t even believe it’s healthy. I served these wraps with organic sweet potato chips – yum! You might also like this Mexican Fiesta Chicken Salad! It really is a great meal for any time of the year, especially summer. I love meals that can double as lunch OR dinner. I’m also loving these Honey Sesame Chicken Salad Wraps from my friend Erin. Healthy, high-protein avocado chicken salad recipe using NO mayonnaise! You can use sandwich bread, a bed of lettuce, pitas, crackers or wraps to go with this easy lunch or weeknight dinner idea. Cover and refrigerate for at least 20-30 minutes to let all the flavors blend together. I am craving this sandwich now and there is probably not one ripe avocado in Hong Kong. Will have to give the Greek yogurt dressing a try! 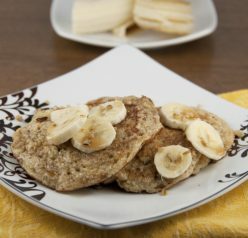 Yum – the Greek yogurt substitution sounds wonderful! Thanks, Eva!! It’s very good! It’s been eye-opening how great Greek yogurt is as a sub for so many things. I love a good wrap and this looks really yummy. It really works well as a sub for mayo and sour cream! This is my favorite way to make chicken salad (and shrimp salad too). It’s all about the combination of mashing avocado and greek yogurt! Fantastic idea here, Ashley. Love it! This looks like an awesome lunch idea! I really need some new ones lately…. I’m in a rut! And with the avocado, I just can’t say no! Plus I love that you used the greek yogurt instead of mayo! I normally have NO ideas for lunch!! This sounds delicious Ashley!! Have a fun week!! I’m so obsessed with them!! Ashley, I love family time and great times like that. Sounds like you had a blast! The Greek yogurt and avocado in with this chicken looks amazing! I LOVE chicken salad made with avocados! Hope you have a great time in Boston! Yum, Ashley! I’m loving the healthier swap and the addition of avocado. Looks delicious! I LOVE this! My family loves chicken salad and we make it often, but I’m always trying to lighten it up. I love that you use avocado and yogurt and it looks so creamy and delicious! Looking forward to making this soon! I didn’t miss the mayo at all!! Love how you healthified a classic! Perfect for lunch! I love avocados and those sweet potato chips. I think I could live off those two things! Very cool that you’d like to visit all the baseball stadiums. I’m sure there are lots of cool ones out there. There definitely are!! Thanks, Laura! The salad looks absolutely divine! I love avocados, so fresh and go perfectly in a chicken salad! Chicken and avocado work so well! I love this lightened up chicken salad! Sounds delicious, Ashley! This looks so good and healthy too! A perfect lunch! You know what, i felt heathier just by reading this post!!!! lovin avocado all the way….. This looks terrific! Love that you used Greek Yogurt! Wow!! this looks amazing!! Healthy and nourishing! i’ve wanted to make chicken-avocado salad!! Because I love chicken… and avocado!! What a healthy, nourishing combo! YUM! This looks amazing! I am not always a fan of subbing yogurt for mayo either, but I can see the avocado mellowing the flavor out very well. Thanks for a great recipe! This looks great, Ashley! 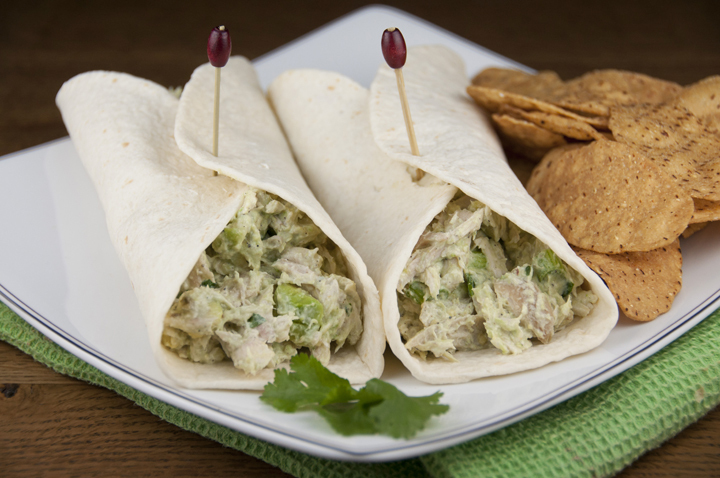 I love a creamy avocado chicken salad and a good wrap makes such a nice lunch! I am a lover of chicken salad and avocado, so I already know this is a recipe for me! Can’t wait to try it for a quick and easy lunch. Looks delicious, and so healthy too! Am adding this to my favourites list right now! This chicken salad looks delightful! I love the avocado and cilantro in it. Very delicious! Now I can prepare a quick and easy meal with his recipe! Thanks for sharing! The site looks great, Ashley! And this avocado chicken salad looks like a fabulous lunch for a hot summer day, with a nice tall glass of iced tea. Love that you use Greek yogurt…it’s all light yet filling at the same time, which is awesome. I am not a huge fan of mayo, so this version is perfect for me! What a great lunch! Great dish! And so full of goodness. Thanks! I am so making this for my dinner tonight! I just need to grab the Greek yogurt on my way home from work! I’m obsessed with avocado too and have one that I need to use today!